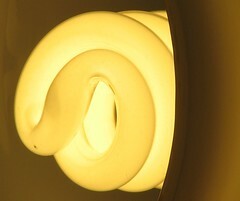 The next time you need to replace a light bulb in your house, consider using one of the compact fluorescent variety. They use less than 2/3 energy than regular incandescent bulbs, last 10 times longer, and will save you over $30 in energy costs over its lifetime. There have been a couple of eye-opening articles about these bulbs lately. From September’s Fast Company there is How Many Lightbulbs Does it Take to Change the World? One. And You’re Looking At It, and from today’s New York Times there’s Power-Sipping Bulbs Get Backing From Wal-Mart. Both talk about the dramatic energy savings our country would see if every American household replaced just one regular bulb with a compact fluorescent one. We’re talking enough power saved to run a city of 1.5 million people. If you know me, you know that I’m far from an environmentalist. I may think the Kyoto Protocol is a complete waste of time and effort, but I do believe that small changes that benefit people in real dollars and cents and are good for the environment are our best hope to conserve energy as a nation. Sure, there will always be a fringe group of people who take part in efforts like the Personal Kyoto project, but the majority of people either need small changes that don’t require too much of them, or need tangible results before committing. So, changing to a light bulb that’s both good for the environment and saves you money should be a pretty easy sell if it’s framed as a “no-duh” decision that you’d be silly to go against. I do recommend watching Al Gore’s “An Inconvenient Truth”, as long as it’s apart of an in-flight experience. I’m a big backer of environmental concerns, but only those that make sense, of course.